Home / Various / Happy Mother’s Day! When discussing which bespoke projects we would write about for Mother’s Day, I came across an image of a pendant that we made for my own Mum a few years ago. 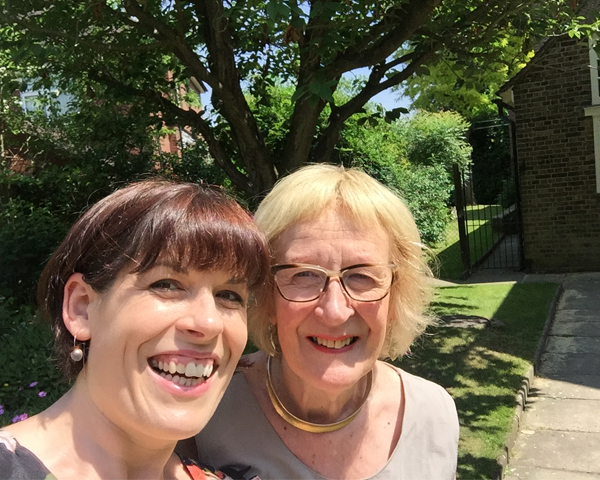 It seems only right that I would write a blog about this special piece in the lead up to Mother’s Day, especially because my Mum has been such a support to me through the years. 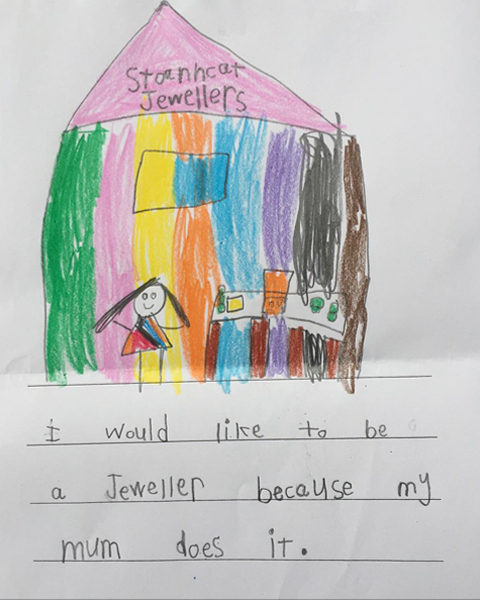 She encouraged me to follow my love of jewellery when I decided that I didn’t want a career in European affairs, having just finished a 4-year degree in European Studies in Trinity. She was interested in each and every piece that I made during my years training as a goldsmith. Most importantly, she is the greatest supporter and fan of Stonechat – she even brings our brochures in her handbag when travelling abroad as you never know when someone might comment on the jewellery that you are wearing! My Mum has a wonderful collection of jewellery made both by me and by the other talented goldsmiths that we stock in Stonechat, but we had never created a bespoke piece for her before. While travelling in Australia, my Dad bought a gift of a beautiful opal for my Mum. Opal, the national gemstone of Australia, comes in many different colours and is generally cut as a cabochon stone – a flat back stone with a domed front. The opal that Mum received was approximately 1cm long, oval and a beautiful rich blue colour. My Dad is a geologist and has a keen interest in jewellery; I wasn’t surprised that he sought out such a beautiful stone. Opal is a relatively soft gemstone and not advisable for pieces of jewellery that receive a lot of wear and tear, like rings and bracelets for example. A pendant seemed the obvious choice for this stone, so we got to work designing a bespoke piece. 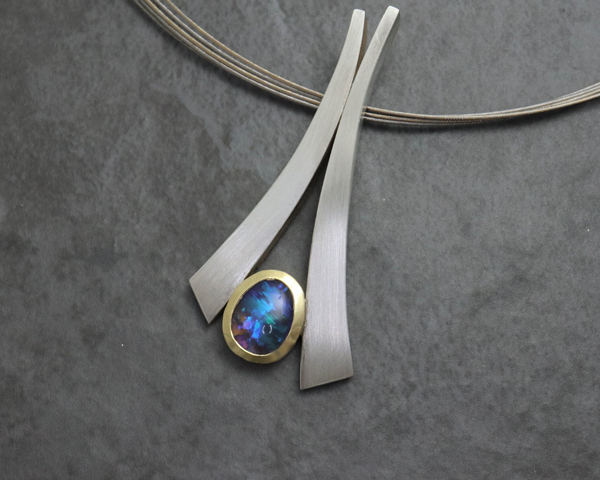 My Mum prefers larger jewellery rather than very fine pieces, so we decided to design a bigger pendant using the opal as the main feature. 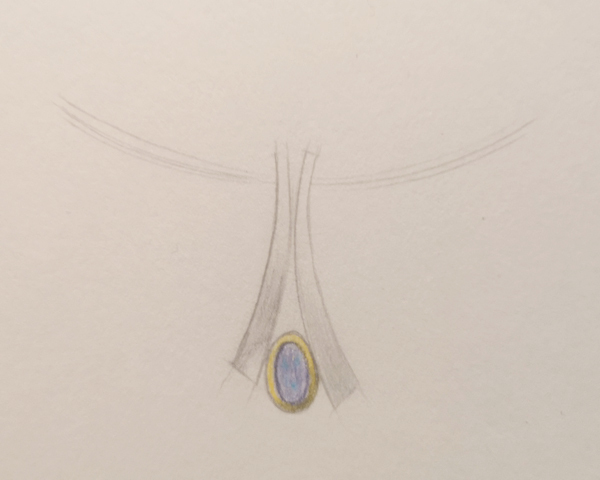 Jemma drew the initial sketches for the pendant, and I asked my Mum to call in so that we could discuss and tweak the design as necessary. She was very happy with the overall shape of the piece, so it was only the finer details that needed to be worked out. 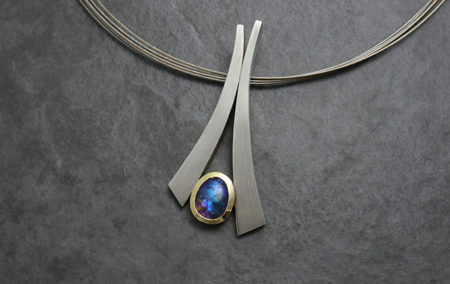 We decided that this opal lent itself to yellow gold as the contrast of the warm gold and vivid blue was beautiful. My Mum loves two-tone jewellery so we chose silver for the larger part of the pendant. The final finishes were worked out – matte for the silver to give an understated look to the piece while the setting for the gold was to be polished to really make the stone pop! We set to creating the piece in our workshop. The silver bars were forged – a metalsmithing technique used to control the shape of the silver by hitting it with a specially shaped hammer on a metal anvil. Forging allows us to create jewellery that moves from thick to thin sections and creates a graceful shape that gives the piece a beautiful depth. The setting was made in 18ct yellow gold which is a richer colour than 9ct gold and therefore gives a greater colour contrast with the silver. Our lead time for bespoke orders is normally 5 to 6 weeks, and I wish I could say that was true for this piece! The wonderful thing about family is that they support you through everything and yet never complain when their orders take a little (or a lot!) longer than customer orders. My Mum knows how extremely busy we are every day and was happy to wait for her piece. The end result was beautiful and she continues to enjoy it. 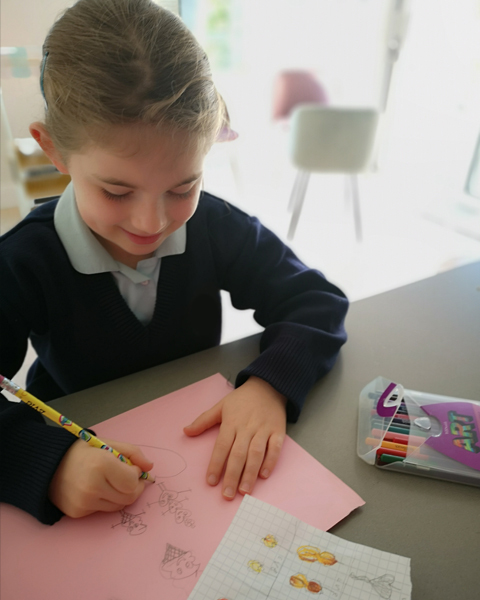 My own girls show a lot of interest in jewellery – Evie (7) loves drawing jewellery designs and is always proud to show me her latest creation. 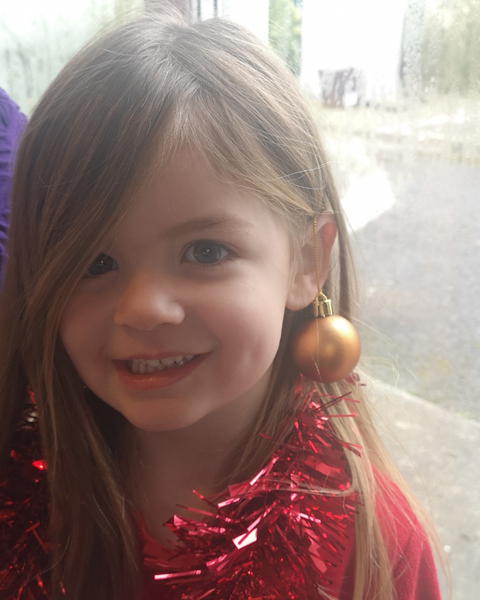 Katie (3) loves sparkle as you can see above! Who knows, maybe one day they will be creating a bespoke piece for me! A Bespoke Art Deco Ring A chocolate diamond is for life, not just for Easter!